20 Tips for Married Couples - Bhakti Rasamrita Swami ~ The Toronto Hare Krishna Temple! We came across a wonderful list of guidelines for married couples, families and anyone trying to build a strong Krsna conscious lifestyle. This list was written by Bhakti Rasamrita Swami, a senior sannyasi (monk) in our Hare Krishna movement. Bhakti Rasamrita Swami completed his B.E. from M.S University Baroda, MBA from Bombay University & worked for some time in a multinational Bank. Inspired by the teachings of Srila Prabhupada, he decided to dedicate his life for propagating the message of Bhagavad Gita and joined International Society for Krishna Consciousness (ISKCON). He was initiated by the spiritual name His Grace Devamrita Dasa. Since then he has served in many important projects and has preached the message of Bhagavad gita very widely, especially to the student community. He served as temple president in Mumbai, Belgaum and Vrindavan- which is the spiritual hub of world wide ISKCON temples. He has been preaching in many prestigious educational institutions all over India. In the month of March, 2010, honoring his dedication and devotion, He was awarded the order of Sannyasa (renunciate monk) in ISKCON, with the title Bhakti Rasamrita Swami. 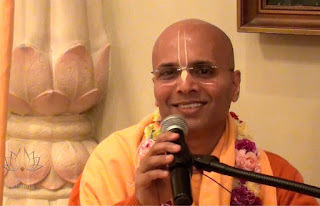 In his more than 30 years of dedicated devotional life in ISKCON, he has rendered several important services, preached in many countries of America, Europe and USSR, and continues to do so. Remember that your house, money, family, etc. are all Krishna's property & that all these have to be engaged in His service. He has very kindly given you all these out of His mercy, and He may take them away as He pleases. So be grateful for what you have & engage all these gifts in His service with devotion & detachment. Keep the Holy name, Krishna katha & the Temple/home deities in the centre of your life. Attend devotional programmes in the Temple & at other devotee gatherings on a regular basis. Especially, hearing discourses/classes live & participating in sankirtana is important. Keep your sadhana strong. Please remember that the best chanting you can do is early in the morning. So avoid unnecessary late nights. It is best to retire early at night, so you can rise early in the morning & be fresh for your sadhana. Your japa is the most important activity of the day. Try to chant clearly & hear attentively. Be in a prayerful mood. Read Srila Prabhupada's books regularly & seriously. This will strengthen faith, conviction & understanding, & help in keeping proper spiritual focus in your day to day life. Remember: guru, sadhu & shastra will show us our proper direction in life. All the members of the family, young & old, should gather together at home at least once every day, to have arati, kirtana & some discussion/reading from the scriptures. Srila Prabhupada mentions this in his purports. Engage yourself in some seva regularly. It is good to take some responsibility, small or big, according to one's situation. Serve with humility, enthusiasm, sincerity & eagerness, without seeking any gross or subtle reward from the service. Do not seek, or be attached to, position or prestige that may be associated with any service. Associate with devotees as much as possible. Live together in the society of devotees with a feeling of friendship towards other devotees, & in a mood of service to them. Ensure that this friendship is not spoilt by ego, envy, self-interest, insensitivity or negligence. Keep Krishna in the centre of these relationships. Avoid the association of non- devotees as much as possible. Where such association is not avoidable (at work, for example), perform your duty well & be socially pleasant. But be careful to not let their non-devotional consciousness rub off on you. Do not join them & take pleasure in the things that they take pleasure in mundane gossip, movies, sports... & violation of the four regulative principles. Set a good example as a devotee, & speak & act in a way that will make them feel positive about Krishna consciousness. Similarly, whilst staying strong in your devotional principles personally, deal with family, in-laws, neighbours, friends, etc in a way that will increase their appreciation for Krishna consciousness. Avoid distracting mundane entertainment offered through cinema, TV, internet & other means. Be careful that you are not overwhelmed by electronic gadgetry, communication devices & social media. Use them judiciously as tools, if you must; do not become helpless tools in their hands. Take decisions (small or big) in life according to how your Krishna consciousness will be affected, directly or indirectly. Consider the short term & long term implications of your decision. Accept whatever is favourable for your Krishna consciousness & reject that which is unfavourable. This should be the ultimate criterion in decision making. Purity (or impurity) of the source of your livelihood will also affect your life & consciousness. Hence choose professions that have minimum possible material contamination & spiritual risk. Avoid professions in which there is a clear violation of the four regulative principles e.g. working for a company that produces or sells liquor. Do not involve yourself in overly risky money earning ventures, being lured by the prospect of very quick & large profits. Avoid illegal business activities of any sort. Spend wisely. Do not unnecessarily spend on things that may not be really required. Live reasonably simply. Follow the principle of "Simple Living, High Thinking”. Do not be tempted or attracted by, or become envious of, the wealth or position of others. Do not become a victim of the modern day consumerist culture with its emphasis on excessive consumption & flashy lifestyles. Save money wisely for the future. Yet, take care to avoid a hoarding mentality. Give something in charity in Krishna consciousness according to your means. Charity is recommended in the shastras as one of the dharmas of a grhastha. Know that your life is meant as a service to others in Krishna consciousness & not only for yourself or your family. Keep this spirit of sacrifice in your heart & keep away any feelings of selfishness. Preach the message of Krishna consciousness whenever you get the opportunity. Follow the advice that Chaitanya Mahaprabhu gave the Kurma brahmana: "Jaare dekho taare kaho Krishna upadesha...." - speak the message of Lord Krishna to whoever you meet. In this way cultivate the missionary spirit. Preaching is not the exclusive preserve of brahmacharis & sannyasis. Grhasthas must also actively participate in it, according to their situation. Do not be unduly absorbed in household & material matters. Yet, do not be neglectful of your household & bonafide material duties. These must be performed with care, sensitivity & responsibility. Bring up your children in Krishna consciousness, never considering it to be a burden. This is one of the most important services for a grhastha. Adjust other services according to the requirements of this service. For example, during pregnancy or when the child is very young, you may not be able to do many other services. But do not mind that. This service is also very pleasing to Krishna. When the time & opportunity are right, however, you may do those other services. Of course, the basic services of hearing & chanting must not be neglected at any time. And it is important to come to the Temple for your own spiritual nourishment as well as for that of the child. Practice, preserve & teach the principles of traditional & devotional family life -faithfulness & life-long commitment in marriage, a culture of respect for all (including elders), sharing, caring, serving, cooking at home, & so on. In this regard, understand well the pitfalls of accepting modern day social norms & practices like unrestricted mingling of men & women, eating out in 'karmi' restaurants,’ living together' before marriage,& so on. Thanks for collecting all these tips in one place. It is worth reading and following.